A Word To Live By. Anticipation: My Word for 2016. This time last year, my friend Jen Gilroy introduced me to the idea of adopting a special word for the year. Jen's word for this year, introduced in her latest blog, is GRATITUDE. My word for 2015 was APPRECIATION, chosen because of making a lifelong dream come true by living in wonderful North Wales and also because of losing a dear friend to a short terminal illness. My choice of 'appreciation' was in tribute to Molly as well as being a reminder to me to be glad of the good things in my life. This year, my guiding word has chosen itself. I'm not a great one for New Year as an event. I'm not fussed about the parties or the resolutions, but this year I find myself looking forward in a way that is unusual for me. I feel eager for what the year will bring. And so my word is ANTICIPATION. After four gruelling stints in hospital in the space of just 14 months, a close family member - once the final convalescence and course of physiotherapy have done their work - will have better health and mobility than for years, which means that we will be able to lead the ordinary lives that most people take for granted. Oh, how we're looking forward to that! One afternoon before the last stay in hospital, we made a list of the things we want to do this year. As you can imagine, we chose various places to visit, but the list also includes mundane jobs like painting the garden wall and putting up a new arched trellis over the back gate. 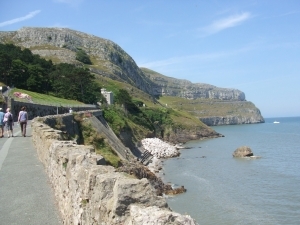 Something I added to the list was a walk around the Great Orme. Marine Drive is around 5 miles long and offers spectacular views. It has been several years since it was possible to enjoy this walk together. Another reason for anticipation is my work situation. Early last year I left a permanent position in order to take up a temporary post doing work I knew I would love. As the end of my contract came in sight, I got involved in the business of seeking other work. As I'm sure many of you know, trawling websites, writing letters, filling in forms, tweaking the CV etc takes a huge amount of time and conseqently other things fell by the wayside somewhat, including my writing. Taking on a Christmas job while still working in the original temporary post on a casual basis resulted in even more time being eaten up. My situation now, and the reason I'm feeling a sense of anticipation, is that the much-loved temporary post has resulted in a permanent offer, though in a slightly different role. I'm thinking about what to do and in the meantime, they are giving me plenty of work to tide me over. And the third reason for anticipation: this weekend I'll finish editing my novel. Submissions ahoy! How fascinating to learn where the idea for the guiding word comes from. Debbie Macomber is such a talented lady. Thanks for your good wishes, Jen. You're right - it feels as if I have turned a corner. I hope 2016 brings good things to both of us. I'm happy to have inspired you to choose a word to guide your year, Susanna. 'Anticipation' is a wonderful word and I wish you a happy year with new adventures. After a tough 2015, it sounds as if you've turned a corner. Thank you for linking to my blog, too. For those who are interested, I was inspired to choose an annual word by US romance and women's fiction author, Debbie Macomber, who wrote a book on that topic called "One Perfect Word." Cathy - lovely to hear from you again. You are most welcome to share my word. It certainly seems to have struck a chord with people. Thanks for dropping by and commenting. Jan - thank you for your comments. I am the eternal optimist, but I have to say 2015 wasn't the best of years. It is good to feel positive as 2016 starts to unfold. One of the things I am looking forward to is meeting up with you at the RNA Conference this summer. Thanks for your good wishes. Great word to start 2016. Yes, I like it and think I'll borrow it from you. Hope you and your friend can go on the walk round the GO soon and pleased to hear your book is nearly finished. Best of luck with it and for your job too. I'm sorry to hear about your recent bereavements, Gloria. It is so hard to lose people we care about. I treasure my memories of lunches with Molly and how much she made me laugh. I'm sure that memories of your aunts must be very close to the surface at the moment. I'm glad you approve of my chosen word. I love the thought of having a list of power words - I'll have to write a list of my own. Thank you for sharing your thoughts. I hope 2016 brings you everything you wish for Susanna. And good luck with your latest novel. It's tough when you lose someone you love. We had a tough year as we lost a dear aunt to cancer in October. We were very close to her. And then her sister passed away on 30th December. But yes, these unfortunate events do make us appreciate things more and to be more grateful for simply being alive and well. We really do need reminders sometimes. Anticipation.....I like that word. I'm feeling that too but I didn't realise it until I read it. I'll add it to my list of power words!